I don’t find amusement parks all that amusing. My idea of an amusement park is the library. You have New Bookland, Non-fictionland, Magazineland, and my happiest stop at the end of a visit – Really Clean Bathroomland. When “if” morphed into “when” we would make our pilgrimage to Legoland Florida, we settled on late March. Since our plans were so last-minute, train or plane tickets to Florida were out. Too pricey. And hobbling down in our ancient, Starburst-encrusted minivan didn’t appeal. But one call to Hertz, and a beautiful minivan would sail us in luxury to Florida with new-car smell and a DVD player overhead. (Desperate drives call for a good video drip.) We left Richmond at six in the morning and pulled into our hotel of choice – the Omni Orlando ChampionsGate – almost forty DVDs later. The Omni Orlando, just thirty minutes from the park, is the closest cool hotel to Legoland. Why not stay closer to the action? Well, Legoland is in Winter Haven which is near Orlando. Winter Haven is stocked with residential homes, suburban shopping, and now a few million LEGO bricks. But definitely no fancy hotel. I should add yet because eventually Legoland Florida will have its own hotel, a la Disney. But for now, the Omni Orlando is an awesome choice for a Legoland stay and worth the outlay. My boys (and husband) spent the first couple of days splashing in the Omni’s lazy river. I spent those same days near the lazy river splashing in a margarita. But eventually, my troop announced that it was time to visit Legoland. No five-minute warning for mom. No empty promises. Nothing. My kids and husband shoehorned me out of my gorgeous guest room, shut down the margarita fountain, lured me into the car with Starbucks, and floored it for Legoland. Even with all of their drama we made it to the park as It opened that spring break Wednesday morning. Brilliant timing on our part because the park stays relatively quiet before noon. After twelve, a wall of feet descends and then it’s every mom for herself. Before I go further let me speak to the criticism that Legoland has endured since it opened in 2011. 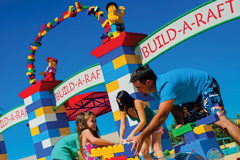 Legoland Florida was created for the most adorable on our planet – kids twelve and under. Some too-cool-for-school kids scoff that Legoland is devoid of scream machines. They’d be right. To them I say: puh-lease. Every amusement park on earth caters to the adrenaline-junkies. Let the toddler-to-elementary group have one park to themselves. All told the 150-acre park delivers fifty pink-knuckle rides and attractions divided into exciting zones that are filled with animals and characters constructed entirely in LEGO bricks. To give you a taste: there’s Duplo Village for toddlers who are at least 36 inches tall; Imagination Zone where kids can take a LEGO robotics class, Meet Stormer from Hero Factory, and build LEGO cars; Land of Adventure where kids can ride the Coastersaurus or take the Safari Trek with its huge elephants, parrots, lions, ostriches (all in LEGO); and LEGO Technic which ranks first on the list for risk-lovers because of its rollercoasters and a water ride for a quick spritz. But the Legoland braintrust had this mom at Miniland USA.Here – all in LEGO – is the Kennedy Space Center with its space shuttle launch; San Francisco including the Golden Gate Bridge; Las Vegas with its elaborate hotels and water features; and DC with Washington, Lincoln, and Jefferson commemorated in LEGO, the White House, and the Capitol. 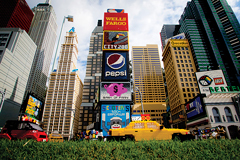 And the Big Apple is here, too, with its many famous sites and Lady Liberty herself. But the kids will go absolutely loopy over the StarWars section of Miniland – and they have every right to. Here you have Darth Vader, R2-D2, Darth Maul – all supersized in LEGO. You have the Ewoks on Planet Endor. You’ve got the Hoth battle where the rebels’ worst Defeat with the Empire took place. You have the Mustafar planet where Anakin Skywalker battles Obi-Wan Kenobi and becomes Darth Vader. (It’s a cataclysmic moment in young Darth’s life. Trust me.) Note: If you have no idea what I’m talking about, ask your kids for elucidation. After Miniland, our favorite thing was the Pirates’ Cove water ski show. Don’t miss the hilarious sight of Miranda, the leader of the soldiers, (LEGO mini-figures who ski) take on goofy pirates, Cap’n Brickbeard, and a shark. These water-skiers are real show-offs and ski barefoot, in pyramids, and off and over ramps. But there’s even more water in Legoland. A very sweet, compact water park joined the dry rides in 2012 – so let your kids wear their bathing suits into Legoland and haul towels with you. Here, kids will love the Build-A-Raft River where they can snap large LEGO bricks onto rafts and ride the lazy river with giant bricks floating alongside. The water park has three water slides with 60-foot drops and two that speed 375-feet down and around, a gentle water slide and play pool for the littlest guests, a massive water playground with a 300-gallon tipping bucket, and a large wave pool. The water park is sparkling clean with changing rooms, lockers, bathrooms, and row upon row of chaise lounges. How to handle rumbling tummies at Legoland? Good news: Legoland does not search bags at the entrance – so it feels okay to tuck healthy snacks into your purse, like fruit, granola bars, bottles of water, trail mix, and sandwiches. The food prices range from crazy to psychotic so bringing food is smart. But if you’ll pay any amount to quell cranky kids – and I hear ya – there are several choices at Legoland. I recommend stopping at Cap’n Brickbeard’s Burger to pick up boxes of burgers and fries before heading into the Pirate Cove Ski Show (they’re next to each other). Sit on the shaded bleachers, dine away, and enjoy the silly fun. The rest of the park is stocked with the usual: more burgers, ice cream, a pizza-and-pasta buffet, and a particularly tasty treat called Granny’s Apple Fries. Coated in cinnamon and sugar, these crispy sweet fries are paired with vanilla cream. Seriously delish. You’ll find these in Fun Town, where you can also catch one of three 4-D movies playing throughout the day at the 700-seat theater. Here’s the bottom line: A one-day park pass is $79 for adults and $71 for kids three to twelve years old and seniors sixty and over. A pass for both the dry park and the water park is $94 for adults and $86 for kids and seniors. Parking for the day is $14. 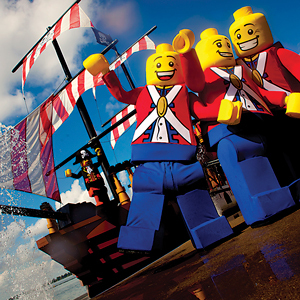 To make the most of your vacation play, go for two days at Legoland by upgrading for just $15 per person. But is it worth it? Put it this way – you know how children’s stages feel endless but disappear in a heartbeat? How there are days where you just can’t take one more knock-knock joke? Or you have to yell, For the hundredth time, no! When they’re nagging for DS or another episode of Ninjago? Well, that’s Legoland. It’s a stage. It will pass. My thoughts? Embrace your mini-figures today. Tomorrow they’ll be in college. Then you can sink into your chaise and splash around in your margarita to your heart’s content. The day will come when you’ll wish that a chorus of little voices would beg you to take them to Legoland. Parent Nirvana: Parents will dig the opulent formal pool that is flanked by eight private cabanas. These babies boast the works: wifi, TV, ceiling fan, lounges, a fridge, robes, and more. I poked around at the front desk and found out that cabanas go for $175 weekdays, $225 a day for weekends, including Friday. 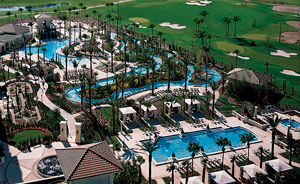 Located close to the cabanas is the Omni’s large hot tub with a fountain in the middle. Park-a-Kid: Second coolest after the pool is the Camp Omni Kids Escape, where for $12 an hour per child, you can deposit your little treasures. Kids four to twelve are shown the good life with activities, movies, and video games. Get Physical: Guests actually wanting to move (as if) will love the lighted tennis courts, the basketball court, and the volleyball sandpit. Golfers will be thrilled To disappear onto one of two 18-hole golf courses designed by Greg Norman. My kids would have loved to play the 9-hole course for families with club rentals, but we couldn’t squeeze it in. The fitness room is lavish with multiple cardio, free weights, and Tvs attached to everything. Grab a Bite: The Omni has several restaurants onsite including a fine dining restaurant, a man cave spot that serves flat-screen Tvs, friendliness, and lots of meat, and a more casual (yet still elegant) restaurant serving Italian at dinner. A small deli, a coffee stop featuring Starbucks, a pool- side cafe, and a golf eatery also make it a snap to pick up snacks. But another thing I love about the Omni is that you can access your car easily to get on and off the property. So if you want to drive nearby to buy groceries or grab an inexpensive pizza, it’s no problem. Not always the case the closer you to stay to Disney. Room with a View: The standard guest room is quite pretty and ample in size with two queen-sized beds, an empty fridge, an updated bathroom, and a giant flat-screen TV that only gets the E! Channel and HGTV (at least that’s what I told my kids). The Omni offers a variety of rooms including suites and connecting rooms. Rates: from $129 in the summer, plus a $20 resort fee per day, plus tax. Self parking is $16 a night. Villa Sweet Villa: The Omni also offers amazing two- and three-bedroom villas with a full kitchen, a stacked washer/dryer, and simply gorgeous bathrooms with sunken tubs. If you go in with another family the price isn’t bad considering you can cook and do dishes exactly as you do at home – and save big. Rates from $379, plus all those fees mentioned earlier. Awesome Family Resort Extras: Like s’mores around the huge fire-pit, a bagpiper at sunset on the golf course, welcome toys for the kids, and complimentary wifi. 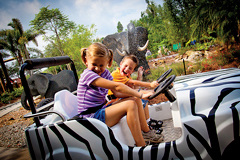 LEGOLAND Packages: The Omni offers two packages for the Legoland-enthusiast. 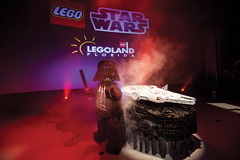 Ask about the Legoland package and the luxury LEGOscape package.